What's more, we're proud to announce that the wait for Rivals is nearly over! Limited quanitites of the Rivals Draft Set will be available for purchase at retailers in the United States next Friday, December 15th to celebrate the holiday season. For more information, just check with your local retailer! Meanwhile, you can look for a full release of Rivals in the first quarter of 2018, with a special release promotion and more information coming soon! Though this special Holiday Preview Wave of Rivals offers a preview of an exciting new product, it's important to note that these cards will not be tournament legal until the product is officially released in the first quarter of 2018. 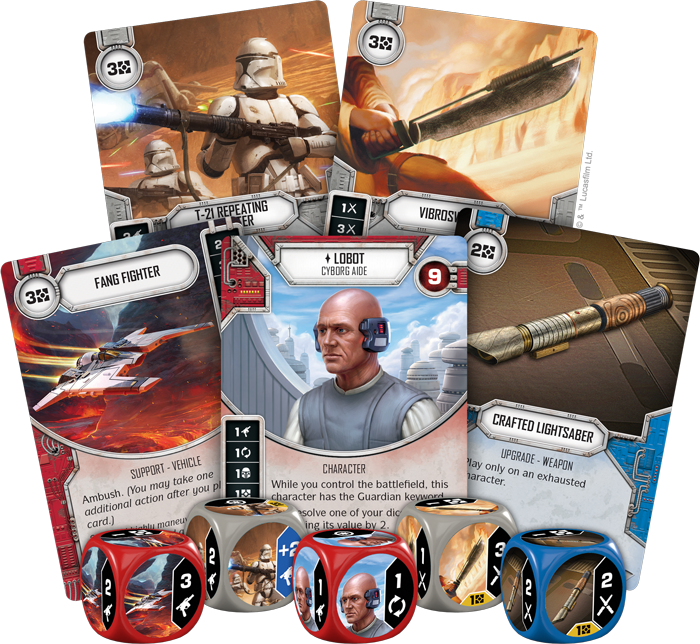 Join us today as we preview a mock draft for Star Wars: Destiny, using the Rivals Draft Set! 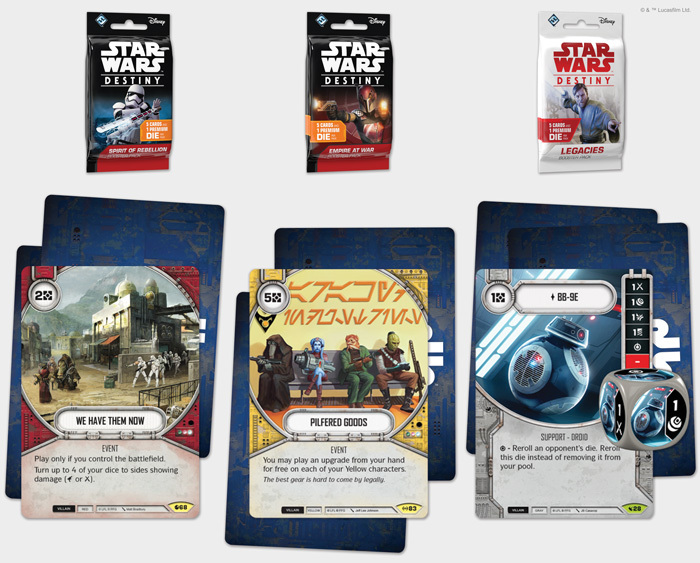 With Rivals ushering in a brand-new format to Star Wars: Destiny, we’re going to look at what a draft might look like. 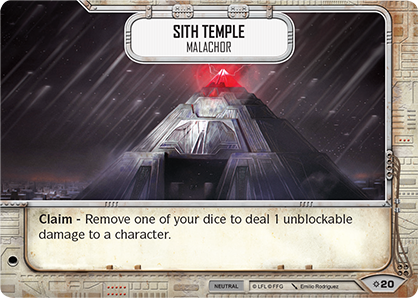 In this scenario, we’re going to follow Star Wars: Destiny player Jesse as he participates in a draft with five of his friends. 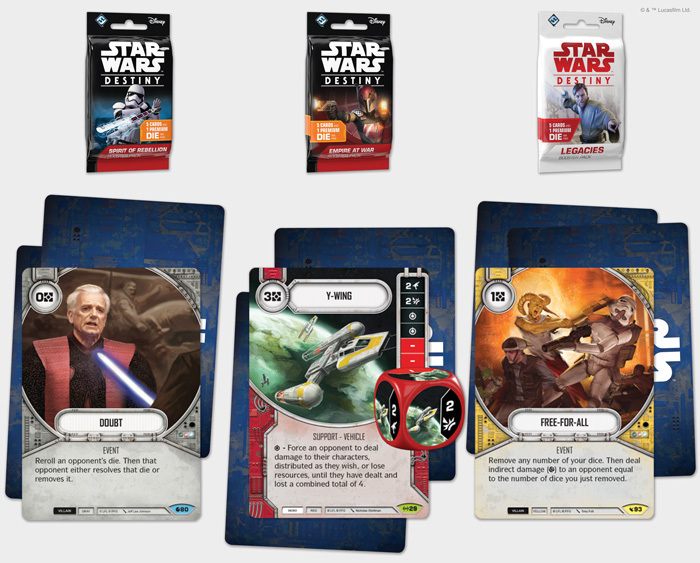 A draft requires each player to have a Rivals Draft Set as well as six booster packs, taken from any sets of Star Wars: Destiny. 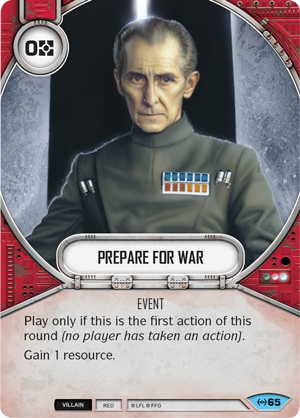 In this case, each player has two packs of Spirit of Rebellion, two packs of Empire at War, and two packs of Legacies. 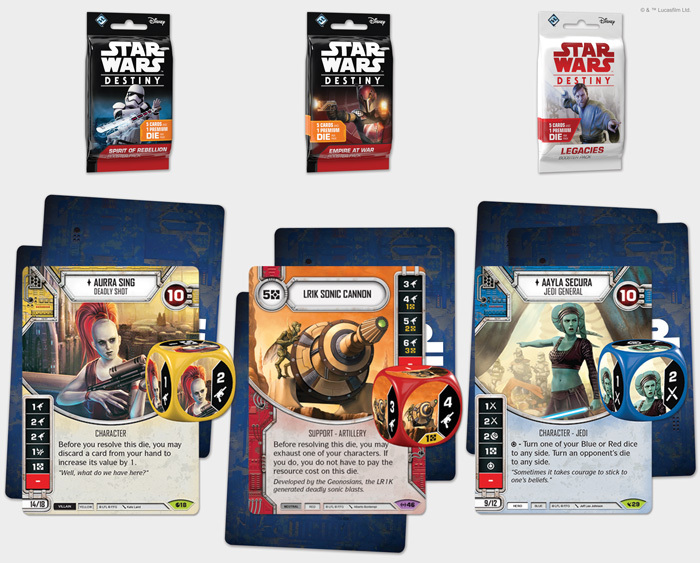 To begin a draft, each player opens three of their packs to create a hand of fifteen cards, setting the three dice from the rares or legendaries from their packs in front of them. Each player selects one card from their hand of fifteen and passes the rest to the player on their left. 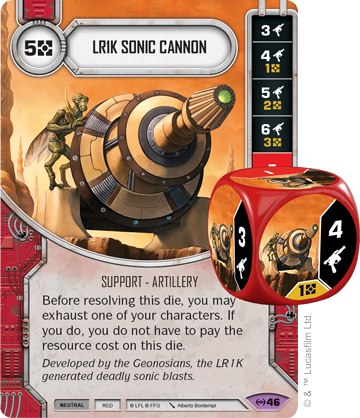 Jesse opens his first three packs, (one from each set) and finds his dice cards to be Aurra Sing (Spirit of Rebellion, 18), LR1K Sonic Cannon (Empire at War, 46 ), and Aayla Secura (Legacies, 29). 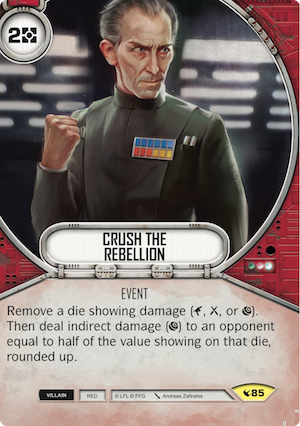 His uncommon cards are Defensive Teaching (Legacies, 106), Never Tell Me the Odds (Spirit of Rebellion, 115) and Fearless (Empire at War, 106). The rest of his cards are commons. Jesse figures he will see multiple copies of these cards during the draft and focuses first on the six rarer cards. In a draft, selecting a character early is an important decision. 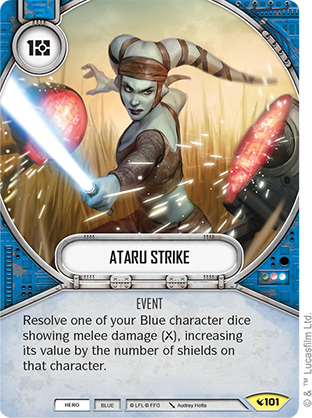 Draft changes a lot of deckbuilding rules, but decks can still only include colors that match their characters. Deciding what you want to build early will help you make important decisions later in the draft and give you a clear direction. 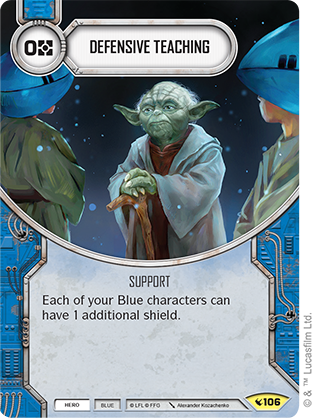 Knowing this, Jesse decides to draft Aayla Secura, with ideas of constructing a Blue/Red deck with Aayla as a centerpoint. Jesse passes the rest of his cards to his left and receives fourteen more. 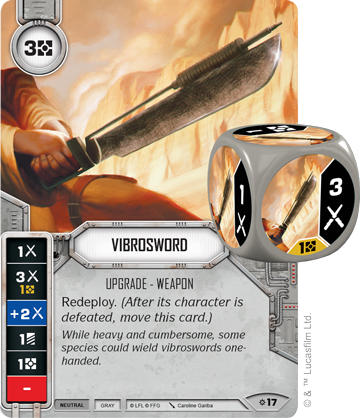 Knowing the commons will stick around for a while, Jesse focuses on the rares and uncommons in the next set. 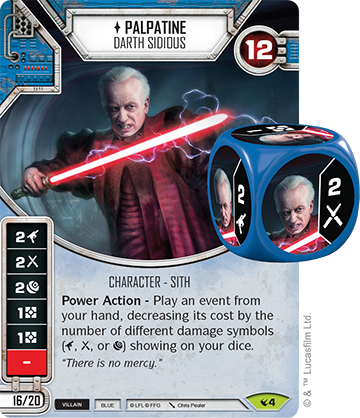 The Legacies rare has already been taken—and by looking at the dice in front of Mike, who's sitting to Jesse's right, Jesse can see a Palpatine, Darth Sidious (Legacies, 4) die with the matching card absent from his current hand. 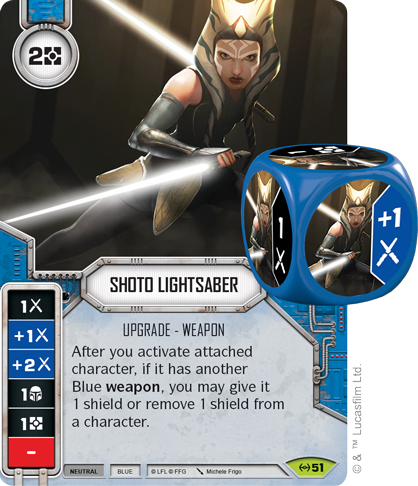 This lets Jesse know immediately that Mike might also be interested in drafting Blue cards. 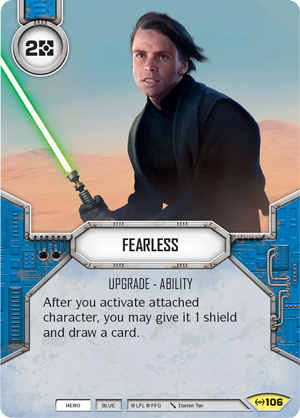 Looking through his options, Jesse decides to draft Lure of Power (Spirit of Rebellion, 16), thinking it will pair well with Aayla’s high damage dealing die. 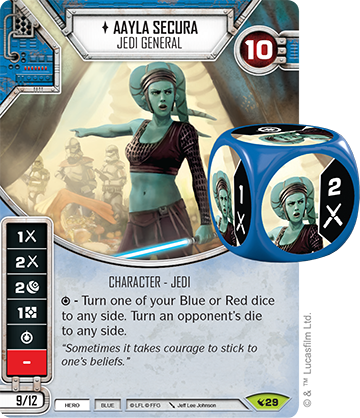 Since draft decks can feature any mix of Hero and Villain cards, Jesse doesn’t have to worry about including Hero Aayla Secura and Villain Lure of Power in the same deck. After another pass, Jesse receives thirteen cards and examines his options. 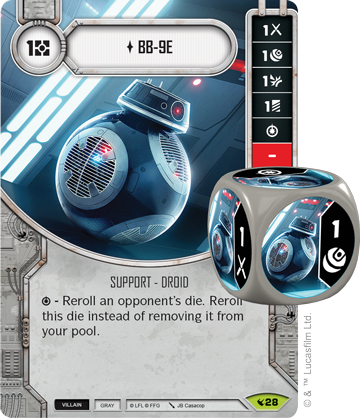 Not seeing anything interesting among the uncommons, and not wanting to draft commons quite yet, Jesse decides on BB-9E (Legacies, 28). 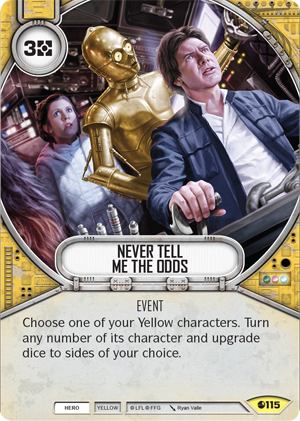 Jesse makes this choice partly because he won’t have many more opportunities to draft cards with dice this round, but also because this card is missing from his collection, and players in the draft get to keep the cards that they draft. 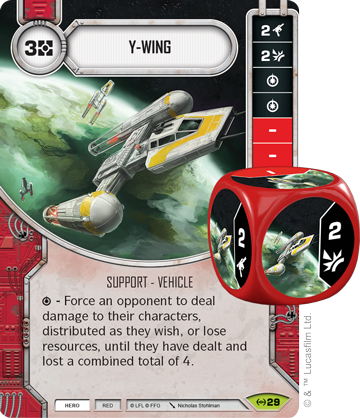 Jesse’s next hand has one rare remaining, a Y-Wing (Empire at War, 29). 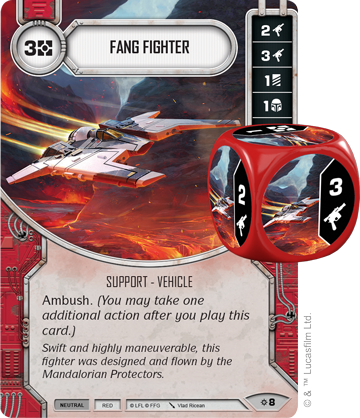 Still hoping to build a deck that's at least partially Red, Jesse selects the Y-Wing, despite not having drafted a red character. 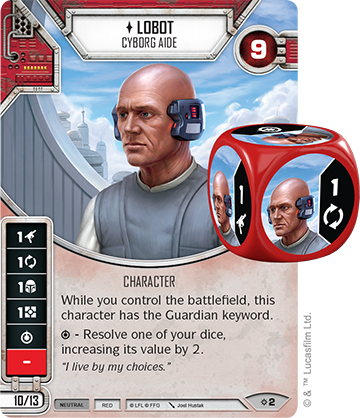 Every player has access to the Rivals Draft Set, so Jesse knows that he can always include Lobot, Cyborg Aide (Rivals, 2) on his team. The round continues until the last card from each hand is drafted. 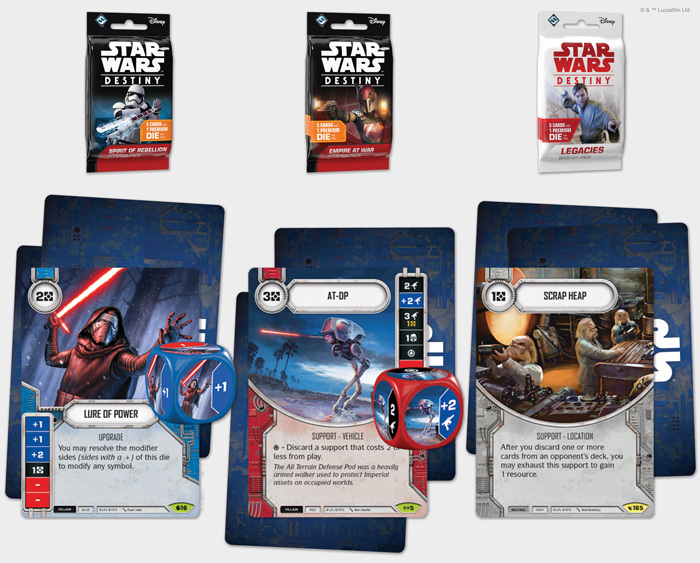 At this point, the players open their next three packs and repeat the process, this time passing their cards to their right. 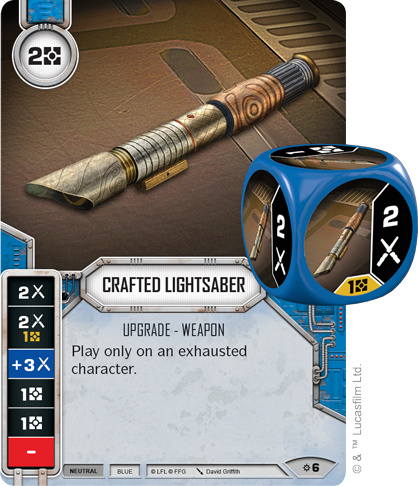 When all is said and done, each player will have thirty drafted cards, as well the twenty cards available to them in the Rivals Draft Set to construct a deck of twenty to thirty cards. After all players have created their decks, they are ready to play! In a typical draft, you'll compete against each other player in the draft one time, tracking your wins as you play. Jesse’s strategy of drafting Red and Blue cards has worked out well. 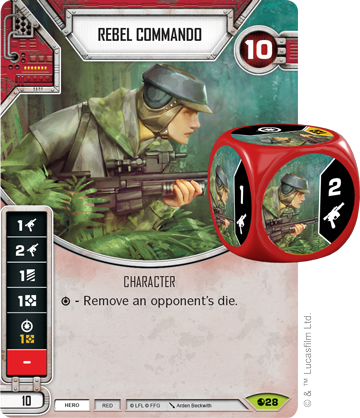 As far as characters go, he knows he wants to build around Aayla Secura and was able to draft a Rebel Commando (Spirit of Rebellion, 28) in the second group of packs. 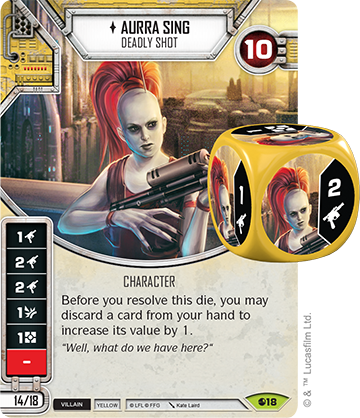 Jesse is still eleven points short of the thirty-point limit, which allows him to include Lobot as a third character. Jesse now selects between twenty and thirty cards to make up his deck. 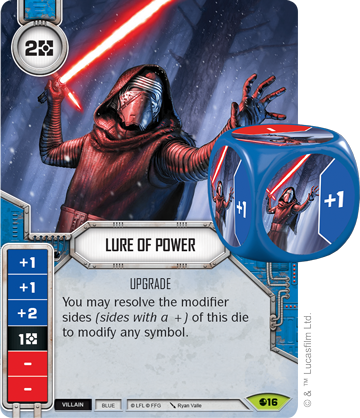 He has selected a fair number of upgrades and supports that include dice, including a Y-Wing and Lure of Power, but he is still looking for more. 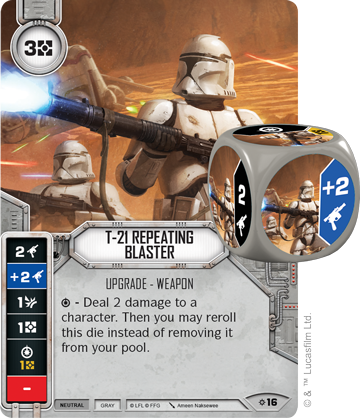 He digs into the Rivals Draft Set to include a T-21 Repeating Blaster (Rivals, 16), Vibrosword (Rivals,17), Crafted Lightsaber (Rivals, 6), and Fang Fighter (Rivals, 8) that will provide some additional firepower. 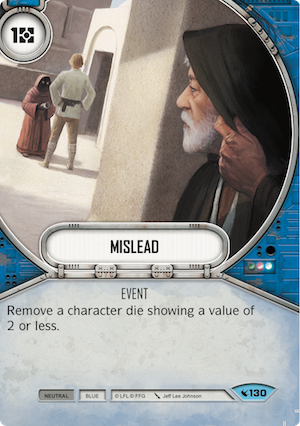 Next, Jesse adds in some dice removal cards to protect his characters in the form of Crush the Rebellion (Legacies, 85) and Mislead (Legacies, 130). 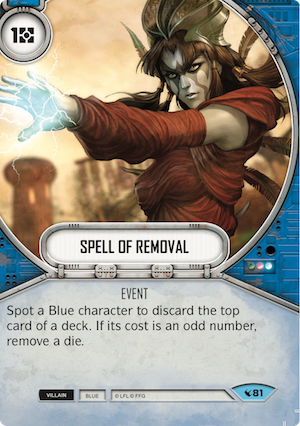 Jesse was able to draft three copies of Spell of Removal (Legacies, 81), and since there is no limit to the number of copies of a single card you can include in a draft deck, he decides to throw all three copies of Spell of Removal in. Next, Jesse adds in some resource generation in the form of two copies of Prepare for War (Empire at War, 65). 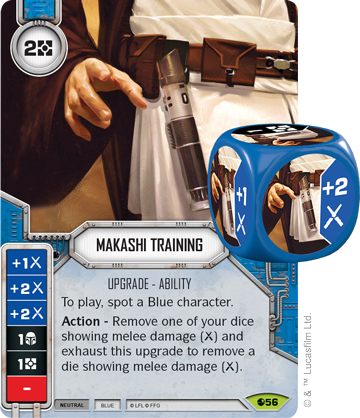 Finally, Jesse adds some cards that will boost the value of his characters' dice. 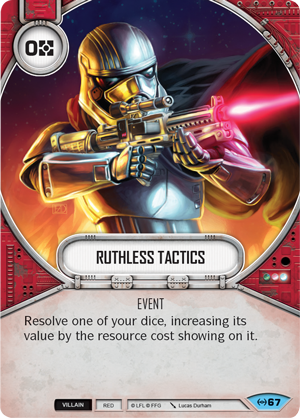 He includes Ataru Strike (Legacies, 101) and Ruthless Tactics (Empire at War, 67) for use with his upgrades. Now, Jesse is ready to play his friends with his very own draft deck! The time for talk is over. Seize your chance to get the Rivals Draft Set next Friday, December 15th from select retailers in the United States, with a wide release in the first quarter of 2018. Do you have what it takes to create the ultimate draft deck? 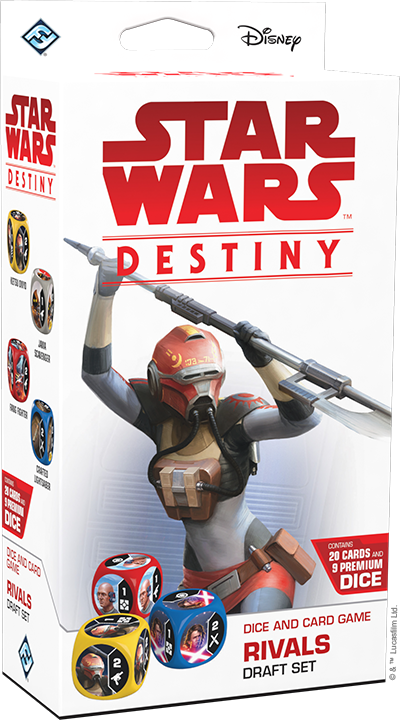 Fulfill your destiny and pre-order a Star Wars: Destiny Rivals Draft Set (SWD06) from your local retailer or our website to prepare for a whole new way to play Star Wars: Destiny.